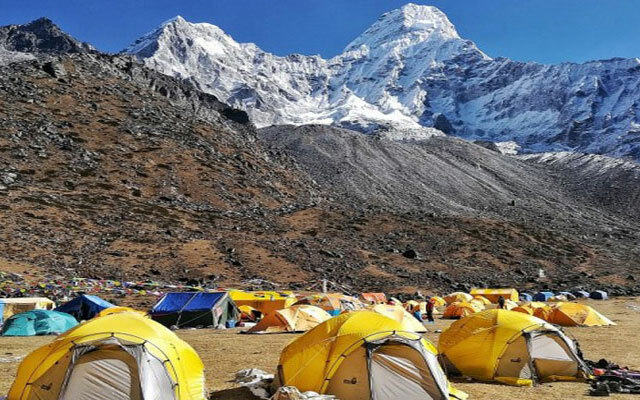 Asian Hiking Team organizes the Amadablam peak climbing start from Base camp, for those climbers who are looking climbing part only. We will arranges all camping logistic, guide, permit, leisure officer etc. You can plan a relaxing trek to Ama Dablam Base Camp, with plenty of time to focus on acclimating and familiarization with the territory and technical challenges on the climb. Meet Asian Hiking Team staffs in Dingboche/Pangboche and climbing Sherpa in base camp, push up Camp I, Camp II, Camp III (option), then success the Amadablam summit. 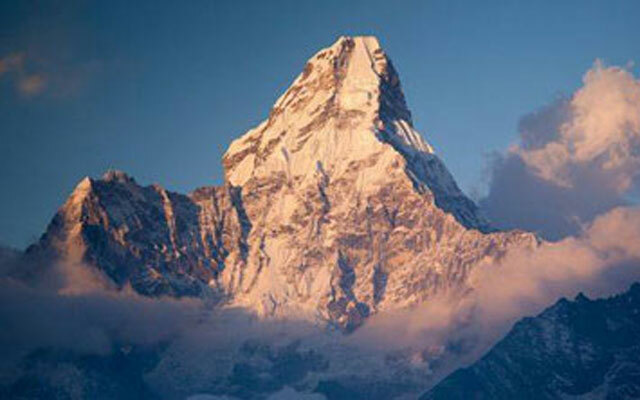 Amadablam is the most popular, beautiful and technical peak climbing in the World. Amadablam means "Mother's necklace"; the long ridges on each side like the arms of a mother (ama) protecting her child, and the hanging glacier thought of as the dablam, the traditional double-pendant containing pictures of the gods, worn by Sherpa women. The main peak is 6,812 metres (22,349 ft), the lower western peak is 6,170 metres (20,243 ft). Ama Dablam was first climbed on 13 March 1961 by Mike Gill (NZ), Barry Bishop (USA), Mike Ward (UK) and Wally Romanes (NZ) via the Southwest Ridge. 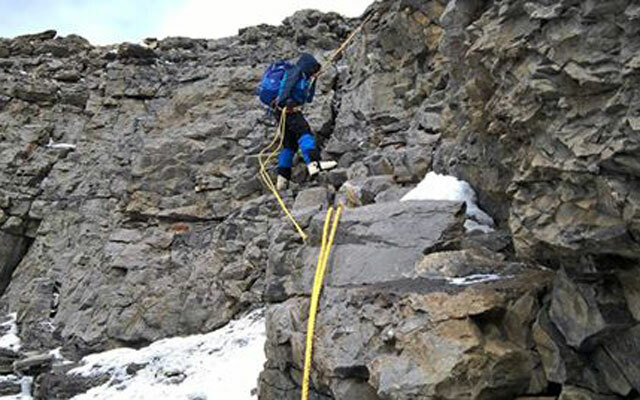 You need to have frozen rock-climbing and Cramponing skills and be able to climb and rappel with a pack on. You'll be Jumaring on fixed ropes. There are several short, steep sections of near vertical ice and rock on the spectacular ridge between Camp 1 and Camp 3 that require strength and technique. 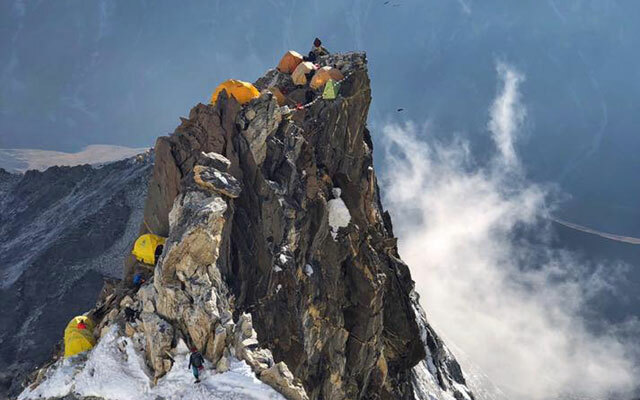 Amadablam is usually climbed un-roped, using fixed ropes, so it is common for climbers to move together but at the same time be semi-independent on the mountain between camps. The most popular route by far is the Southwest Ridge. We typically set up three camps along the ridge with camp 3 just below and to the right of the hanging glacier, the Dablam. But after 2015 April earthquake we have not seat the Camp 3, we climb from Camp II. To reach the first camp from base camp, have to pass the toughest and the difficult passing through the difficult saddle ridges; and then should spin to the north climbing up through the rocky land and through the boulder. From Camp I, one has to cross the rocky sink and should climb the ridge via to the fixed lines to Camp II. From Camp II after crossing over severe rocks and ridge which lead you to a camp III. Your successful historical ascent to the summit will reward you with an outstanding, breathtaking, panoramic mountain view and give you endless memories that you will wealth all your life. Day 01: Meet our staffs in Dingboche / Pangboche, final preparetion, check all equipment and meals, overnight stay in Lodge/Hotel yourself. Day 02: Dingboche/Pangboche to Ama Dablam Base Camp trekking 3-4 hours, Overngiht at Camp (L/D). Day 03: Rest day in Ama Dablam Base Camp, Overnight at Camp (B/L/D). Day 04: Asian Hiking Team staff fix the Camp 1, return to Base camp, overnight at camp (B/L/D). Day 05: Rest day in Base Camp, Overngiht at Camp (B/L/D). Day 06: Base camp to Camp 1, Overngiht at Camp (B/L/D). Day 07: Asian Hiking Team Staff fix the camp II and return to Camp 1, Overnight at Camp (B/L/D). Day 08: Return to Base Camp, Overngiht at Camp (B/L/D). Day 09: Extra day for summit attempt, return to base camp, resting, Overnight at Camp (B/L/D). Day 10: Extra day for summit attempt, return to base camp, resting, Overnight at Camp (B/L/D). Day 11: Base Camp to Camp I, Overnight at Camp (B/L/D). Day 12: Camp I climb to Camp II, Overnight at Camp (B/L/D). Day 13: Summit Ama Dablam, return to Camp II, Overnight at Camp (B/L/D). Day 14: Camp II to Camp I, Overnight at Camp (B/L/D). Day 15: Camp I to Base Camp, Overnight at Camp (B/L/D). Day 16: Extra day for summit attempt, return to Camp, resting, Overnight at Camp (B/L/D). Day 17: Extra day for summit attempt, return to Camp, resting, Overnight at Camp (B/L/D). Day 18: Clean the base camp hot breakfast and own way trekking to Pangboche or own route (B). Amadablam Expedition royalty and climbing permit. Three times meals a day (B/L/D) freshly cooked with Tea or coffee, water by professional cook in Base Camp. Baggage/ Equipment allowance up and down to base camp is maximum 50-60kg per person. All camping equipments like camp furniture (table, chairs), kitchenware, kitchen, dining, guest and toilet tents in Base camp. Base Camp tent with mattress and pillow for each member, climbing Sherpa, BC staff and Liaison Officer. High altitude tents for all members and climbing Sherpa’s. Wages, meals, accommodation, equipments, medical and accidental Insurances for Sherpa guide and other staffs. Insurance for climbing Sherpas, cooks, Liaison Officer, and local porters. Rope fixing fee for Ama Dablam only payable to EOAN (expedition operators association of Nepal). Hotel and Meals during the trekking (Lodge/Hotel). Excess personal member’s baggage transport Kathmandu-Lukla-Base Camp.